Water, Propanediol, Glycerin, Aluminum Starch Octenylsuccinate, Calophyllum Inophyllum Seed Oil, Silica, Acrylamide/Ammonium Acrylate Copolymer, Caprylyl Glycol, Ethylhexyl Palmitate, Melaleuca Alternifolia (Tea Tree) Leaf Oil, Polyisobutene, Caprylic/Capric Triglyceride, Titanium Dioxide, Phytosphingosine, Polysorbate 20, Sorbitan Isostearate, Limonene, Citral, Leptospermum Petersonii (Lemon Tea Tree) Oil, Tocopherol. Have moderate acne on face, and lots of red marks/scars, especially on cheeks and chin. Found this to be really good for fading marks over time. Didn't seem to dry out my skin much, or have any adverse effects. Only problem for me is, whilst it has been good in the past, I have now been focusing on using BP and retinol topicals (alternately) so this has took a back seat as I worry about overwhelming my face. Sadly not an actual miracle worker, but definitely would recommend anyway... liked it enough to buy another bottle recently. I have very oily skin but dryness around my mouth and on cheeks depending on the treatment I'm currently using. This lotion is awesome! It's light weight, good for sleeping in. Super smooth, non-greasy and smells amazing. Not fixing my acne, however it is definitely doing my skin good. This is fanastically effective for keep pores clear and breathing overnight on oily skin, or on acne recovering from a breakout. (I'd recommend BP or sulfur for PM active acne outbreaks.) 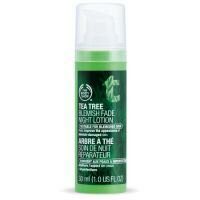 It also works as a spot treatment on extracted lesions, or on t-zone comedones, without overdrying like other tea tree products. Calms redness, stimulates circulation for healing red marks.